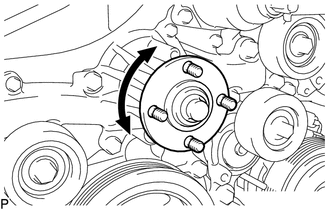 (1) Remove the fan pulley (See page ). (2) Press a piece of thin paper towel against the drain plug or deposits on the lip of the drain plug and check that the paper towel is not wet. If the thin paper towel is wet, replace the engine water pump assembly. If the thin paper towel is dry, clean the area around the engine water pump assembly. (a) Turn the pulley and check that the water pump bearing moves smoothly and quietly. (b) Install the fan pulley (See page ). 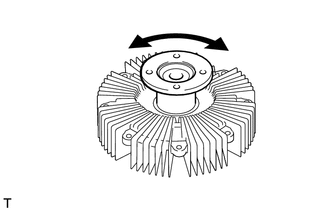 (a) Remove the fan with fluid coupling assembly (See page ). 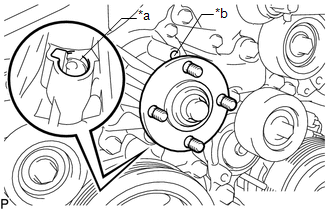 (b) Remove the 4 nuts and fan from the fluid coupling assembly. (c) Check that the fluid coupling assembly is not damaged and that no silicon oil leaks. If necessary, replace the fluid coupling assembly. (d) Install the fan to the fluid coupling assembly with the 4 nuts. 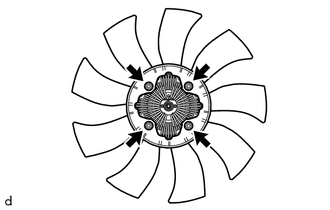 (e) Install the fan with fluid coupling assembly (See page ).